Earlier this year, the UK government's National Archives, released a further batch of fifteen UAP files. I recently had the opportunity to examine the contents of these files. In the files, we find a large number of low-level interest sightings, made by members of the public, police officers, pilots etc., relayed to the Ministry of Defence (MOD) via RAF bases, local police, the Civil Aviation Authority and other agencies. We also find details on a number of cases which cried out for, but did not receive, investigation and analysis. There are also copies of MOD internal memos on a range of topics, including sightings, and policy. There is much correspondence from members of the public asking all sorts of questions. Included in this area, are also, questions from sugch officials as Lord Hill-Norton; MPs, and UAP researchers such as David Clarke. It is not my intent to conduct an exhaustive analysis of this large set of documents; no doubt others elsewhere, will do this. My intent is to simply sample things which interest me, and will therefore possibly interest readers of this blog. Kean refers to it as written in 1993 as part of the precursor to the UK's Project Condign. The newly released UK UAP papers now reveals the truth behind the redactions. This appears to be Kean's 1993 document's paragraph 2. It does reveal that Kean's interpretation of the redactions as, redaction one 'Russia' and redaction two as 'US intelligence, is indeed correct. However, there is additional information available on DEFE 24/3152 pages 219-220. These are on a DI55 paper titled 'Unidentified Aerial Phenomena (UAP), dated 19 June 1995. It is a pity that we have had to wait almost a quarter of a century to learn the above. Between 1959 and 1972, there were over thirty individuals who served on the committee of the Victorian Flying Saucer Research Society/ Victorian UFO Research Society. In this post I identify these individuals and the committee positions which they held, and provide information about a number of them which will be new to most blog readers. Some individuals such as Peter Norris; Paul Norman and Judith Magee, played a major role in the development of the society during these years. Others came and went. Sadly, I am aware of a number of such people as Judith Magee, William (Bill) Stapleton, and Paul Norman who are deceased. Committee, Dec 1959 – Nov 1962; Vice President & Programs Officer, May 1964 – Dec 1965; Secretary, Dec 1966 – Dec 1967; Vice President, Oct 1968 – Dec 1972. ‘Vice President: Mrs Judith Magee has been a member of the V.F.S.R.S. since 1958 and a committee member since 1959. She completed a secretarial course at Brighton Technical School and worked in a Melbourne radio station and bank prior to joining the Women’s Royal Australian Naval Service in March 1944. After demobilisation in 1946 she joined Australian National Airways as an air hostess and in 1947 became the only woman finalist in the Sun flying scholarship. Since her marriage in 1948 she has worked as a diathermy operator, mannequin and saleswoman. ‘”Nests” and “Landing pads.” AFSR No 2, Jul 1970, pp 12-15. ‘Are the UFOnauts gradually revealing their presence?’ AFSR Vol 1, Mar 1970, pp 8,9 & 14. ‘UFO activity along the NE coast of Australia.’ Flying Saucer Review (FSR) Vol 11 No 5 p14. ‘Queensland again.’ FSR. 1966. Vol 12 No 2, p26. ‘UFO over the Mooraduc Road.” FSR 1972. Vol 18 No 6 p6. Investigations & Sightings Officer, May 1964; Public Relations Officer, May 1965- Dec 1970; Public Relations Officer & Sightings Investigations Officer, Feb 1972. Public Relations Officer, Dec 1972. ‘Public Relations Officer, Mr Paul Norman was born and educated in the United States. With the exception of six years in the U.S. Navy and a short period as a Publisher’s Representative, he served in various positions up to Hydro-Electric Power Project Superintendent with the U.S. Corps of Engineers and is Charge Engineer in Thermal-Electric Stations. Paul Norman had interactions in the USA. According to Ann Druffel's book 'Firestorm' (2002) about the late professor James E McDonald, ‘Paul Norman corresponded with McDonald shortly after McDonald's public entry into the field, and the two exchanged UFO reports and other material. In early May 1967 Paul Norman came to the states to visit relatives and made arrangements to visit McDonald in Tucson. Norman first visited Allen Hynek and Vallee in Chicago, principally to discuss a couple of UFOs which had been taken by reliable witnesses in Australia, then went on to Boulder, Colorado where he met with some of the staff of the Condon committee…for Condon’s staff had staff also had interest in cases worldwide. Norman instigated the visit to Australia, in 1967, of Professor James E McDonald. Norman and other VFSRS committee members arranged for McDonald to interview a number of witnesses to Australian sightings. For summaries of these Australian McDonald interviews, click here. ‘The Condon Report in Bits and Pieces.’ AFSRS Vol 1, Mar 1970 (Vic) pp 2, 3 & 19. ‘A fierce new look at Unidentified Flying Objects.’ AFSRS Vol 2, Oct 1964 pp 15-18. ‘The electro-magnetic effect of the UFO.’ AFSRS Vol 4, Dec 1965, pp 3-5. ‘UFOs and the mystery signals from outer space.’ AFSR No 8, Oct 1968, pp 2-3. ‘Gravity powered objects.’ FSR 1965, Vol 11, No 2, p20. 'Mr Peter E Norris, LL.B has headed this society since its foundation in 1957. He was born in 1932, educated at Wesley College and graduated Bachelor of Law from Melbourne University in 1958. He is an elected councillor of the City of Chelsea and a member of at least six other civic bodies in that City. Norris was an APRO representative, and numerous articles appeared in the APRO Bulletin, which were based on material submitted by Norris. Librarian, Dec 1959; Investigations & Sightings Officer, May 1964; Sightings Investigations Officer, May 1965 – Jul 1966; Vice President & Sightings Investigations Officer, Dec 1966. ‘Vice president and Sightings Investigations Mr Rumpf has been a member of V.F.S.R.S. since the inaugural meeting in February 1957. He was the society’s first librarian and is the society’s first sightings investigations officer. He was educated at Scotch College, Melbourne and has worked at the University of Melbourne as a research assistant and has been employed in many fields of selling. Secretary, 1961 – Dec 1965. Sightings Investigations Officer, Dec 1967 – Oct 1968. ‘Sightings Investigations Officer: Mr Neville Thornhill was born in South Africa and migrated to Australia at the age of fourteen where he continued his education at Brighton Grammar School. He later studied engineering at the Royal Melbourne Institute of Technology and Swinburne Technical College. His sporting activities have been many and varied and he is currently an active member of the Mountain District Pistol Club. He is married and has two small children. His interest in U.F.O’s was aroused by his engineering mind and an earnest desire to assist in solving the problem. Thornhill wrote at least one VFSRS article. ‘UFO Investigation’ AFSR No 1, Mar 1970, pp 5,6 & 12. Technical Advisor, May 1964- Dec 1965.Committee, Dec 1966; Tape Librarian Dec 1967 – Oct 1968. Committee, Dec 1959 – Nov 1962. Librarian, Oct 1968 – Jul 1970; Committee, Feb 1972 – Dec 1972. Public Relations Officer, May 1964; Assistant Sightings Investigations Officer, Oct 1968. Treasurer, Dec 1965 – Dec 1966. Committee, Dec 1966. Assistant Secretary, Dec 1967 – Oct 1968; Minutes Secretary, Mar 1970 – Dec 1970; Committee, Feb 1972. Secretary, Dec 1959 – Jan 1962; Treasurer, May 1964. Committee, Dec 1959; Librarian & Magazine Editor, May 1964; Librarian, Apr 1960 – Nov 1962. Assistant Librarian, Dec 1959; Committee, Apr 1960 – Jun 1962. Secretary, Oct 1968; Assistant Secretary, Mar 1970; Publications Officer, Jul 1970 – Feb 1972. Sightings Investigations Officer, Dec 1972. Librarian, Feb 1972 – Dec 1972. Vice President, Dec 1959 – Apr 1960; Vice-President & Treasurer, Sep 1960- Nov 1962. Sightings Investigation Officer, Mar 1970- Dec 1970; Committee, Feb 1972. Stapleton wrote at least one piece: ‘The Dartmoor Phenomenon.’ AFSRS No 2, Jul 1970, pp 17-18, and was involved in an extensive investigation into the 1972 Maureen Puddy, Frankston CE3, and possible abduction. Librarian, May 1965 – Dec 1966. Secretary, Feb 1972 – Dec 1972. Treasurer, Jul 1970; Committee, Feb 1972. A/g Treasurer, Feb 1972 – Dec 1972. In a previous post I discussed what we know of a tantilising story from the son and daughter of a high official in the former Australian Department of Supply, in relation to his knowledge of the 6 April 1966 Westall incident. Over my years of searching government archive material held by such agencies as the National Archives of Australia (NAA) and the National Library of Australia (NLA) I have learnt that these organisations are constantly making new material available. I thought it would be worth my while, spending some time, doing yet another search for any further material on Mr 'X.' This search proved to be very fruitful. 2. Gives a photograph of him in 1935. In order to ascertain whether or not anyone could deduce the identity of Mr X from this photograph, I used a number of web based reverse image sites to check if it is possible to determine the source of this image and thus reveal his identity. I was unable to find Mr X's real name from this image, and this is why I provide the photograph here. If you use "copy image address" you will only get "Capture_Photo_1935.JPG." 3. Advises that he was appointed as an Engineer in the Postmaster General's Department in 1937. 4. Shows that he moved to the Department of Civil Aviation in 1946, and became a Senior Airways Engineer. All of this is consistent with the account of his career as conveyed in 2010 by his daughter. 5. I have also found some leads concerning positions within the general area of what became the Aircraft, Guided Weapons and Electronics area of the Department of Supply in 1967. In 1963 it appears to have been titled Aircraft and Guided Weapons Supply Branch, Department of Supply. Unfortunately, the archive material for this era, is currently not yet available. I have submitted a request to be advised when this material becomes publicly available. Hopefully, this will confirm the position within the Department of Supply which Mr X held on 6 April 1966. I wish to thank my Sydney research associate, who wishes to remain anonymous, for giving me the idea to look in a particular part of the Australian government archives, where I located this new information. If, perchance, Mr X's daughter or son reads this, I would appreciate if they would get in direct contact with me at keithbasterfield@yahoo.com.au. In a Facebook post dated 10 November 2017, and titled 'The troubled Public Servant,' Westall researcher Shane Ryan, reported that in 2010 he was contacted by a woman with some inside knowledge about the 1966 Westall, Melbourne incident, gained from her father. I have decided to annotate her words, rather than addressing points raised at the end of her text. 'I am writing to you because I hadn't realised there were so many other witnesses to an event that my father was involved with in 1966. My father was the Assistant Controller of Aircraft, Weapons and Guided Missiles with the Department of Supply in Melbourne. 1. Shane found a Department of Supply Bulletin, in the National Library of Australia which confirmed that Mr X was indeed the Assistant Controller of the Aircraft, Guided Weapons and Electronics Supply Division of the Department of Supply in August 1967. We have not been able to confirm his position on 6 April 1966, the date of the Westall incident.
' He was a brilliant intellectual, Dux of High School, First class honours in Engineering and a science degree in Electronics all in 3 years. I mention this because he was not a fool, or someone who would dream up what he saw. 2. A check of the National Archives of Australia revealed Mr X's war records, which indicate he was an Engineer. 'I do not know how he was involved in the sighting of the object. He was, however told (by someone senior to him) that if he were to speak of this incident to anyone, he would lose his job. 3. A search of the Internet reveals that the immediate senior of the Assistant Controller of the Aircraft, Guided Weapons and Electronics Supply Division of the Department of Supply was in fact the Controller, of the Aircraft, Guided Weapons and Electronics Supply Division of the Department of Supply. On 6 April 1966, this was one Ian Bowman Fleming. He held the position between 1958-1967. Fleming was the director of the project which produced Australia's first unmanned target aircraft, Jindivik. Unfortunately, we are unable to seek any knowledge about Westall from Fleming as he passed away in 1993. 'He used to say that knew what he saw, he was very angry that this event was not seen as an opportunity. He was intimidated on a regular basis about what he saw by other officials and told that a person in his position could not be taken seriously if he were to speak of it. He was a respected point of contact for the Americans, French and Italians as they were all in the market for selling us their aircraft. 4. Here then, is an intriguing statement: 'this event was not seen as an opportunity.' One possible interpretation was a UFO was involved, with a potential opportunity to learn about advanced propulsion systems. 'I knew about the object he saw from very early on in the event, and I was also told not to speak of it to my school friends, teachers or anyone. 5. Earlier Mr X's daughter wrote: 'I do not know how he was involved in the sighting of the object.' Here she states: 'I knew about the object he saw.' These appear to be contradictory statements. Did he see the object, or simply know of the incident? Was he at Westall that day? We will perhaps never know. 'I was 10 and after my father said we were not to speak of it, my mother continued to talk to me, mostly because of the torment my father appeared to be going through over this incident. 'My father came to work for the Department of Supply after he was approached for this position while manager of Civil Aviation in Sydney. He held this position from 1960-1968 then continued on in the position in Canberra until his early death in 1970. The research by Shane and I indicates that Mr X lived in Melbourne in 1966; was the Assistant Controller of the Aircraft, Guided Weapons and Electronics Supply Division of the Department of Supply in August 1967; was an engineer, and moved to Canberra in December 1968. Unfortunately, neither Mr or Mrs X are alive today to directly discuss his knowledge. I understand from Shane that he has had no contact with Mr X's daughter or son since 2012. Although I am aware of the identity of Mr X; and his son and daughter; out of courtesy to Shane Ryan, my research hands are tied. However, I would urge Shane to attempt to recontact both the son and daughter and see if any additional information may have come to light since 2012. In a Facebook post dated 12 November 2017, Shane provided us all with additional information. 'In December 2012 some months after receiving an email from him, I was telephoned out of the blue by the son of the Department of Supply senior officer. He was calling on a mobile from a McDonald's in rural Queensland. I think now that he was checking me out over the phone as much as anything. However, he wanted me to know that as senior, and as sceptical, a public servant as his father definitely was, he was profoundly affected by what had happened at Westall. Now, let me say at the outset, that all of the above may be true, however a number of questions arise to which we currently do not have answers. 1. How did Shane know that the individual calling was Mr X's son? 2. How did Shane know that the call came from a McDonald's in rural Queensland? One can only surmise it was because the individual calling him, told him this? 3. Did the individual inform Shane of the floor number of the building in Canberra? Was Shane ever able to confirm this was the location of ASIO in Canberra in 1966? 4. I can understand that it would not have been possible for Shane to confirm the individual's statement about working for the Australian Federal Police. But, did the individual offer to produce any documentation to support this claim? I appreciate, that for some individuals reading this blog, my insistence on fact checking and verifying information supplied, may well annoy them. However, think on this, we are being told that there was a government involvement and coverup in the Westall incident - a big story - surely this should cross checked in fine detail? For a look at the work on a circular aircraft for the RAAF, by Squadron Leader Gordon Waller in 1966 click here. For a look at an earlier post about ASIO and Australian UFO groups, click here. For a detailed look at the involvement of the former Australian government Department of Supply, click here, and here. From time to time, I am contacted by individuals who tell me of UAP sightings from earlier years. Other people send me newspaper accounts of such events. These are all most welcome, as they add to our knowledge of previously unreported observations. This post describes two such recently submitted items. 'Growing up I didn't believe in aliens, but that belief changed in a flash. In the 1970's I was sitting out on deck of the destroyer Anzac just after sunrise, getting fresh air before duty. We were heading to a destination in the South Pacific, doing about 18 knots. The sea was as smooth as glass and no-one else was on deck. A strange feeling suddenly came over me. I looked up and above the funnel was a shimmering mass the size of a medium car, making no sound. It looked like it was generating great power. The letter was signed Leon Forrest, Burnie. I have referred a copy of the letter to Phil Polden, TUFOIC, Tasmania for his information and comparison with anything in the TUFOIC records. 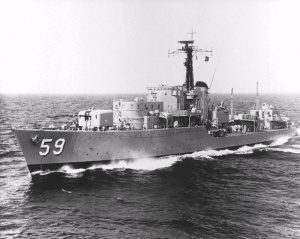 An Internet check revealed that in 1961 the 'Anzac' was refurbished as a training vessel, and remained in service until 1974, and was eventually scrapped in 1975. This indicates that the sighting may be dated between 1970 and 1974. The ship sailed between Australia, Papua New Guinea,and various ports in the South Pacific on training missions. I received an email from an individual describing an encounter near Murray Bridge, South Australia. 'The night was on a Saturday. When I was travelling along Jervois road towards Murray Bridge. Approximately 11 kms south of Murray Bridge. I observed a UFO stationary over the river Murray. This would have been about ninety meters above the water. I stopped my car. When a friend of mine drove past. I wanted him to also observe what I had seen, so proceeded to try to chase him down. However after travelling after him for about a km rethought, about what I had seen and that I would have to chase him for a considerable distance to catch him. So I returned to where I had seen The UFO. On arrival at the site the vehicle had disappeared. Because of a hill being in between me and the river. I am unsure if the craft had descended below the level of sight, behind the hill down toward the surface of the river or departed from the area. On reflection I now believe they would have been going to collect water from the river. The vessel was very big. With no noise that was discernable from my location. The size was something that particularly struck attention. It would have been larger than a normal AFL football field. The shape being that of flying saucers,with one inverted above the other. Around the outer circumference were a number of orange lights. Since that time I have observed photos of nuclear reactor core. I now believe the orange lights were in fact nuclear reactor cores from memory I recall there would have been about eight on the side of the craft that was visible from where I observed it. The craft would have weighed many thousands of tonnes,had it been constructed of earthly materials. However it appeared weightless.sitting absolutely stationary. I proceeded to the location of the Murray Bridge Police station to report what I had seen. The Officer taking my statement was taking the whole thing a bloody joke so I walked out and have never mentioned the incident to anyone since that time. On 5 July 1967 at 0057hrs local time, a Mr P P Langford of Robby's Aerial Services was travelling on the main Murray-Bridge to Karoonda Road, and was about 5 miles NNE of Murray Bridge at the time. It was a clear night sky, but there was heavy ground fog. Suddenly the vehicle's radio became full of static, increased in intensity and became a high pitched whine. He turned the radio off. About 100-150 yards later the vehicle's motor simply stopped. The ignition key was still in the on position, but the dashboard warning lights, i.e. oil, temperature etc came on. Langford then reported noticing a distinct break in the fog where stars were visible in the sky. A large, dark shadow was visible above the road and between two bands of fog, at a height estimated as 60 feet. Above this shadow, which he estimated to be ten feet thick, was a greyish-blue glow. By the time Langford got out of the vehicle to investigate, both the shadow and the light had gone. There had been no associated sound at all. The witness got back into his vehicle, tried the ignition switch and the motor started. Turning on the radio he found that the static had gone. If any blog readers can add further details to either of the above events, I would be most grateful. We continue to hear references to the 6 April 1966, Westall school incident, in a variety of media outlets. Unfortunately, for us, these outlets, are simply using the event for their own gain. In almost all such instances, this is simply a matter of ratings and entertainment. UFOs are very newsworthy for this purpose. In my opinion, continuing to try and raise the profile of the incident, via radio, television, podcasts, newspapers, and websites, in the hope of officially confirming the nature of the incident, is doomed to failure. The year’s long search, for official Australian government documentary proof, has been unsuccessful. In addition, no one from the Australian Department of Defence (Army, Navy, and Air Force); ASIO, or any other government department has ever come forward to confirm what happened at Westall that day. These negative facts continue to fuel a ‘conspiracy’ perspective, when they may merely indicate, that there is no such ‘evidence.’ Indeed, I note that under the main title for the Westall66 documentary are the words ‘a forty-four year conspiracy.’ Suggestions of this nature do not help. I have been told that Westall ‘witnesses’ need closure on what actually happened. However, all I see from my viewpoint, is frustrated individuals becoming even more frustrated and angry, e.g. the reactions on the Westall Flying Saucer Incident Facebook page to blog posts by myself on the HIBAL hypothesis (an idea to be debated); and to Paul Dean’s recent piece about Hazel Edwards’ testimony. On the publicly available information (and if anyone has any addition information, please publish it for us all to debate and discuss) on the Westall incident, there is still much confusion as to basic pieces of data, e.g. (a) how many objects were present at around 10.20am that morning, or were subsequently present; and (b) the precise location of physical traces. There is no official Australian (or American) government information, and no Commonwealth government official has come forward to tell us what happened that day. These facts need to be continually kept in mind, not summarily dismissed. If after all these years of trying to get to the bottom of this incident, we haven’t succeeded; then perhaps it is time to let go. To close down the Yahoo Groups and Facebook Westall pages, and move on to other more profitable areas of UFO research. Offer closure to ‘eye witnesses’ by stop talking about the incident. Otherwise, I see we are simply in for years more, of the same circle.